Students being welcomed to the masterclass with an introductory talk on accelerator science at Daresbury. Between the 6th and 8th of March the Cockcroft Institute hosted its annual Particle Physics Masterclass (PPMC) at Daresbury Laboratory. 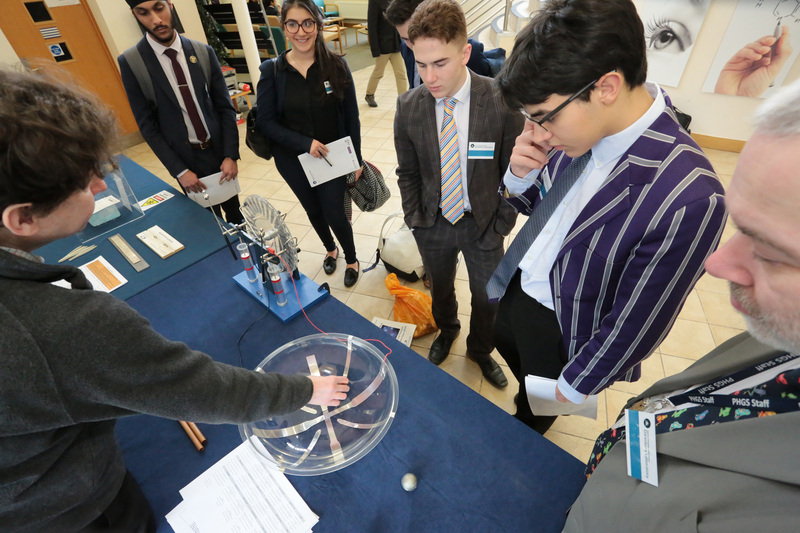 The PPMC programme, which gives a broad overview of particle physics and accelerator science, is targeted at GCSE and A-level science students and has grown to become popular with schools in the north-west and beyond. 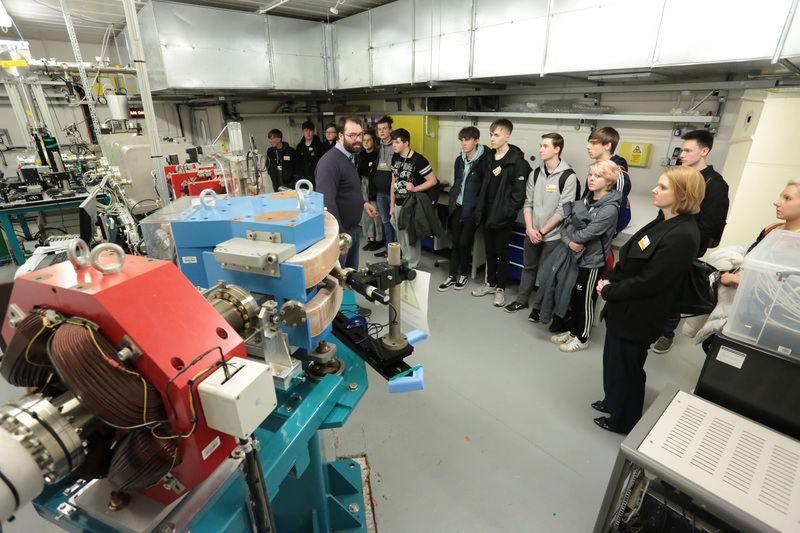 This years’ event was organised by Dr Alex Bainbridge (ASTeC) with support from Wendy Cotterill (Daresbury public engagement) with support on the day from several members of ASTeC, staff and students from all four CI universities, and the Hartree Centre. In total 250 students and 27 teachers visited the lab over the 3 day event. 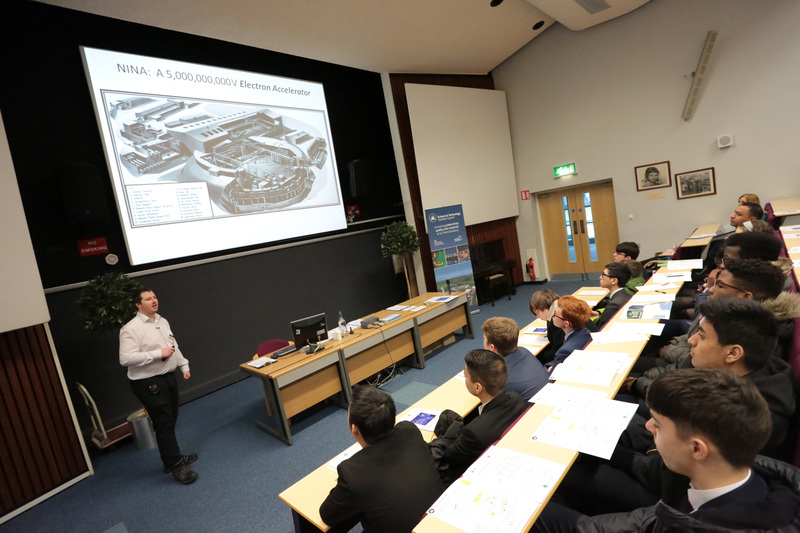 They were welcomed with an opening talk by Alex Bainbridge on the history and development of particle accelerators at Daresbury. They were then split into 4 groups that rotated through activities including a tour of the CLARA/VELA accelerator, a series of demonstrations of accelerator technology including vacuum science, electrostatic acceleration and superconductors, a talk on magnets for accelerators followed by a tour of Daresbury’s magnet test laboratory, and an interactive computer based activity developed by Lancaster University in which students are taught how to identify particles from collision data before identifying the Higgs boson signature. Each day was concluded with a lively talk by Fred Loebinger (Emeritus professor, University of Manchester) on the discovery of quarks, gluons and the Higgs Boson. Ricardo Torres (UoL) shows students how the same forces used to accelerate particles can be scaled up to accelerate a ping-pong ball.